The eagerly anticipated second offering in Red Clay Sangha's new study series is now open for registration. In this session we'll take a close look at the Buddhist teachings on Karma: What is it? What causes it? Why did the Buddha consider it an important part of his teachings? How does it benefit us to understand it? 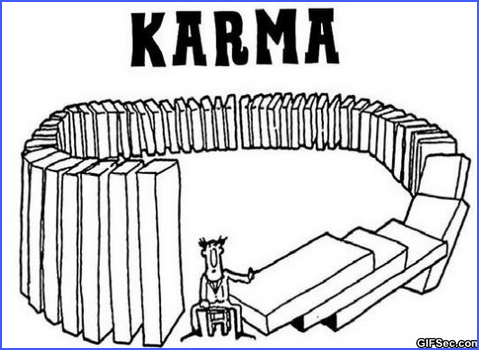 How can we work through or with harmful karma? How can we cultivate beneficial karma? Excerpts from Buddhist suttas and commentary from teachers and meditators in a variety of traditions including Yogacara, Tibetan, Zen, and Theravadan will be used to guide the group's study and give us something to chew on. There will be ample time for Q&A and discussion, and meditation time as well. A simple vegetarian lunch and snacks will be provided. Hope to see you there! Elizabeth A. Gibson has been a Buddhist practitioner for ten years, primarily in the Insight/Vipasana tradition. She is a technical writer and poet and has lived in Atlanta for nine years. If you have questions, please contact Elizabeth Gibson.